'Syriana': Provoking Thought on the Fight for Oil A power struggle over oil in the Middle East is the backdrop for the new film Syriana, starring George Clooney and Matt Damon. Critic Kenneth Turan says the movie is one of "paradoxes, contradictions and complications... it takes numerous risks, and thrives on them all." A power struggle over oil in the Middle East is the backdrop for the new film Syriana, starring George Clooney and Matt Damon. Critic Kenneth Turan says the movie is one of "paradoxes, contradictions and complications... it takes numerous risks, and thrives on them all." A power struggle over oil in the Middle East is the background for the new film "Syriana," starting George Clooney and Matt Damon. Los Angeles Times and MORNING EDITION film critic Kenneth Turan has this review. "Syriana" is a film of paradoxes, contradictions and complications. 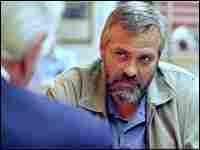 It's a political thriller that thrives on misdirection, on hiding information just as it hides glamorous George Clooney behind a rumpled exterior and a full beard. Mr. GEORGE CLOONEY (Actor): (As Robert Barnes) They let young people march in the street and the next day, they shut down 50 newspapers. Put a few satellite dishes up on their roofs, let them have "My Two Dads." That doesn't mean that the ayatollahs are surrendering one iota of control over that nation. Unidentified Man #1: Mr. Barnes, the reform movement in Iran is one of the president's great hopes for the region and crucial to the petroleum security of the United States. Unidentified Man #2: These gentlemen are with the CLI, the Committee for the Liberation of Iran, Mr. Barnes. TURAN: "Syriana" is intent on grappling with one of today's biggest stories, the fight to control the planet's dwindling supply of oil. The film is a fearless and ambitious piece of work made with equal parts passion and calculation. It's an unapologetically entertaining film with compelling real-world relevance. As written and directed by Stephen Gaghan, it's also a film that takes numerous risks and thrives on them all. Gaghan, an Oscar winner for writing "Traffic," is not shy about using Hollywood ingredients like melodrama and major stars. But what he does with them is the opposite of standard. Gaghan uses the cover of genre picture-making to present the scathing critique of how America acts to protect its interests, how we try and get the world to dance to our tune. This is a film that makes your head spin and more critically, your mind ponder. Mr. CLOONEY: (As Robert Barnes) Now they're asking me questions about the Imiri(ph) brothers, asking me questions about Tehran. Unidentified Man #3: You got to understand, this wrecks careers. I shouldn't even be talking to you. Mr. CLOONEY: (As Robert Barnes) I punched in Prince Nasir Al-Subaai and my computer gets seized. Now where'd that job come from? Where did the Nasir job come from? Unidentified Man #3: I'm advising you to drop it. Mr. CLOONEY: (As Robert Barnes) Why am I being investigated? Why am I being investigated, Fred? TURAN: This is also a film, frankly, that can be as confusing as it is involving, that tells its story in a way that can be all but impossible to follow. That's truly Gaghan's determination to use mystification in the service of what he sees as a greater good. "Syriana's" a film that chooses to consistently place the audience one step behind the action. Throwing us into the middle of things heightens the film's sense of reality that makes it easier for us to believe "Syriana's" thesis, that a shadowy amoral cabal of Washington power brokers are pulling the strings that control the world. This is conspiracy theory film-making of the most bravura kind. And if only a fraction of its suppositions are true, we're in a world of trouble. INSKEEP: Kenneth Turan reviews films for MORNING EDITION and the Los Angeles Times. "Syriana" opens today in limited release and nationwide on December 9th. So that's one of the films available this Thanksgiving weekend.